Since yesterday evening, Hurricane Matthew has gathered strength and is on a collision course with the Caribbean. Here’s what we know about the strongest hurricane to hit the region since 2007. This morning, the hurricane briefly drenched Colombia as a it went through the northern tip of South America. Heavy flooding was reported and authorities say at least one person is dead as a result of the storm. A 67-year-old man was reportedly swept away by a flash flood in a region hasn’t experienced rainfall in four years. Now, Matthew is on course to hit Jamaica, Haiti and Cuba. Prime Minister of Jamaica Andrew Holness called an emergency meeting of Parliament on Friday to discuss preparations for the storm and Jamaicans began stocking up on supplies. It’s possible that Jamaica could begin feeling the effects of Matthew as early as today but the hurricane is expected to make landfall in the eastern part of the country on Monday. Forecasters say that rainfall could reach 10 to 15 inches with some areas of Jamaica and Haiti getting 25 inches. 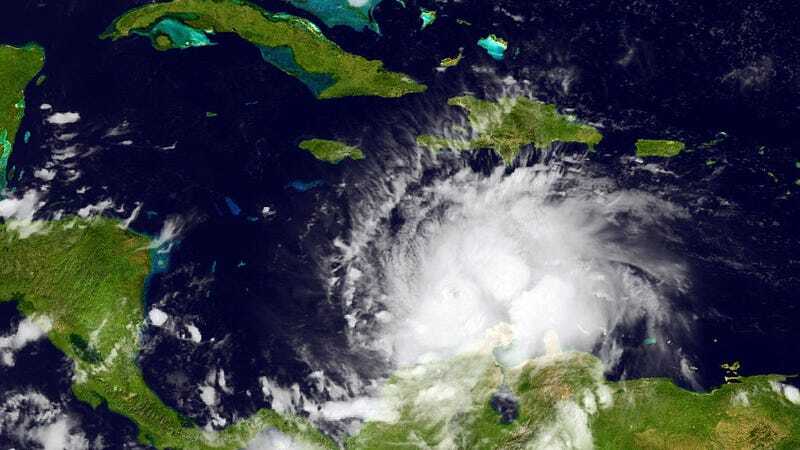 Haiti’s civil protection officials are warning that the country will be “highly threatened” by big waves and storm surges over the next 72 hours. As of 11 a.m. this morning, Matthew was about 390 miles southeast of Kingston and moving west at 6 miles per hour. Current trajectory of Hurricane Matthew. Image: National Hurricane Service. AccuWeather forecasting says that the hurricane “will continue to move westward across the central Caribbean Sea before making an abrupt turn to the north later this weekend.” That turn could determine whether or not Matthew makes it to Florida later this week. For now, the mountainous terrain of eastern Cuba is expected to weaken the storm below hurricane status before it reaches the Bahamas.